The stones are still not set. They are just sitting loose in the mountings to visualize the finished piece. This was a long day and late night in the studio. I called it a night with the completion of the soldering and Tripoli finish deciding to do the final polish and stone setting the next day. Steps not shown are the soldering of the bail and chain. 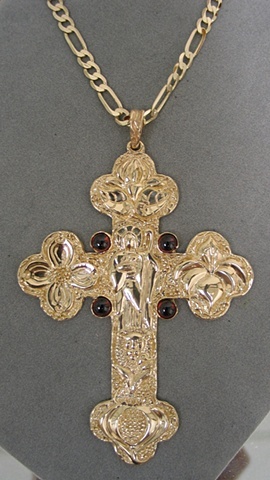 Finding a supplier with a 36 inch chain is near impossible so I buy 2 shorter lengths of a chain style I can solder together to make the length needed for a pectoral cross.